Slather on some sunscreen and head to one of these scorching-hot events. So it’s hot and crowded and the food can be a bit of a letdown. The world’s largest music festival is still more than worth the price of admission, and you should visit at least once before Arcade Fire closes out the 2018 lineup. What’s better than a motorcycle ride on a warm summer day? An apocalypse-themed motorcycle ride with a strict costume requirement, pit stops for food and drinks along the way and plenty of photo ops. Riders can also commune over a bonfire in Riverwest the night before. The Milwaukee Ballet Company’s dancers prove that they can pas de deux anywhere, by staging a series of informal performances at libraries, gyms, community centers and other unconventional venues around the metro area. The series culminates with a performance at 7 p.m. on the 26th at the Peck Pavilion. Visit milwaukeeballet.org for more info. Composer John Williams created one of the most memorable scores in movie history for A New Hope. Members of the Milwaukee Symphony Orchestra play the Oscar-winning score in its entirety, while the film screens alongside them. Vintage photos courtesy of MOWA. Turn eating and drinking into an artistic experience at this biennial West Bend event. MOWA has paired vintners from Napa Valley with Wisconsin-raised chefs who work across the U.S. (like Alfonso Torres, of New York’s La Compagnie des Vins Surnaturels) and asked them to create a series of avant-garde dishes as beautiful as they are delicious. If you didn’t think hair-cutting could be competitive, think again. Today, barbers from across the Midwest will battle it out for top honors in a series of categories, such as “Fastest Fade” and “Tag Team Freestyle,” snipping and clipping while you cheer them on. Follow Kyle Denton, one of the co-owners of Tippecanoe Herbs, as he leads you from the Charles Allis gardens to the Villa Terrace grounds – pointing out interesting plants along the way. This is a rain-or-shine event, so bring an umbrella if the sky seems overcast. Nothing encapsulates the spirit of summer more than a beach bonfire. The Friends of the Lakeshore State Park are inviting you to gather around a roaring fire to roast s’mores and watch the sun set at this evening event. The Summit Players, a traveling Shakespearean theater troupe, present a slightly abridged version of Twelfth Night to audiences amid the rolling hills of this Menomonee River Valley park. Feel free to bring a blanket and a picnic dinner – just leave the rotten tomatoes at home. ffer you unlimited pours and a commemorative pint glass. Take in the beauty of our fair state while supporting a worthy cause by signing up for a 25-, 50-, 100-, 175- or 250-mile bike ride. There’ll be food and entertainment along the routes, and all proceeds raised will fund AIDS research in Wisconsin. A hot spot for college students and recent grads, Brady Street parties hard every day of the year. 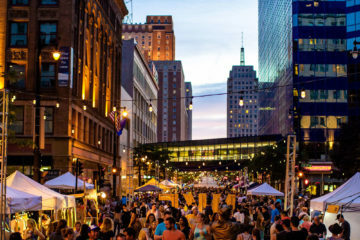 But it’ll be especially raucous on the 28th, when a motley assortment of musicians, magicians, comedians, BMX riders, professional wrestlers and dancers will perform along the street while vendors ply passerby with food and booze. One of the city’s quirkiest museums is ringing in its sixth anniversary today, with beer and brats, a cooking demonstration courtesy of Genevieve Davis, a ComedySportz performance and a slideshow featuring scenes from old Milwaukee. The members of this five-man indie band must feel at home in Wisconsin. Songwriter and guitarist Aaron Dessner co-founded the Eaux Claires festival with Sconnie native Justin Vernon in 2015. And many of the band’s songs, like “Bloodbuzz, Ohio,” immortalize the people and landscapes of the Midwest. The National. Photo by Shane McCauley. “Agenda” appears in the July 2018 issue of Milwaukee Magazine.